A friend of one of the San Bernardino attackers has been charged in connection with the mass shooting that killed 14. Enrique Marquez, 24, is the first person arrested over the deadliest terrorist attack in the US since 9/11. Mr Marquez is charged with plotting with gunman Syed Farook to attack a university in 2011 and 2012. He is also accused of illegally purchasing the two rifles that were used by Farook and Tashfeen Malik. "While there is currently no evidence that Mr Marquez participated in the December 2 attack or had advance knowledge of it, his prior purchase of firearms and ongoing failure to warn authorities about Farook's intent to commit mass murder had fatal consequences," US Attorney Eileen Decker said. According to the criminal complaint, Mr Marquez called emergency services hours after the San Bernardino shooting and told the dispatcher that the attackers "used my gun". The charges against Enrique Marquez provide a chilling glimpse into an alleged terrorist cell on American soil. According to the FBI, the details were obtained during 11 days of interviews with Mr Marquez in which he is said to have admitted his role in plotting murder. Tomlinson Avenue in Riverside — where Mr Marquez and Syed Rizwan Farook once lived next door to one another — was the suburban street at the heart of the alleged plot. It was here that Mr Marquez was introduced to Islam by Farook and it was here that the pair allegedly watched radical Islamist videos including lectures by a former Al Qaeda leader, Anwar Al-Awlaki. Mr Marquez is also said to have viewed online videos produced by a "US-based tactical equipment manufacturer," to have trained at California gun ranges and to have studied an Al Qaeda magazine, written in English, on how to make bombs. The extent of online plotting, undetected by the authorities, is sure to intensify the debate about the balance between liberty and security in the US. Mr Marquez told authorities in detail about the earlier terrorist plots that were never carried out. Mr Marquez and Farook planned to bomb a local university, where they had both been students, and shoot students as they ran away, according to court records. They also had plans to attack a motorway during afternoon rush hour by dropping pipe bombs onto cars and shooting into cars and at law enforcement, the records said. Although they did not explode, several pipe bombs were used in the San Bernardino attack. Police killed Farook and his wife in a shootout a few hours after they open fired inside a holiday party attended by Farook's co-workers. Mr Marquez told investigators he bought the weapons for Farook because he looked Caucasian while Farook looked Middle-Eastern. In 2012, he and Farook visited firing ranges and continued to plot their attacks, authorities said, but then Marquez distanced himself from Farook, following the arrest of other suspected terrorists in the area. Becoming radicalised in secret - How frequent are "lone-wolf" attacks? Authorities also charged Mr Marquez with entering a sham marriage with Farook's relative so she could gain legal status in the US. He was paid each month for his participation in the sham, according to court records. Federal agents raided his mother's home in Riverside, California, where he had been living, three days after the attack. 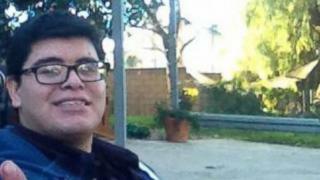 Mr Marquez worked as a security guard at Wal-Mart and dreamed of joining the US Navy, the Los Angeles Times reports. He checked himself into a mental health facility shortly after the attack, posting a garbled message to Facebook: "I'm. Very sorry sguys. It was a pleasure."